Lithops are simultaneously the easiest and the hardest succulents to care for. They practically demand to be ignored; you’ll find they fare far better with little intervention. But alas, they are too interesting to be ignored completely. 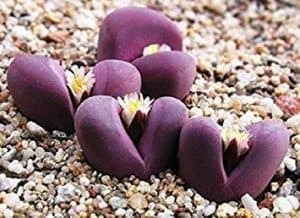 What follows is the most comprehensive guide to lithops on the internet. Lithops is the scientific name of the genus, but it is also often used as a common name. It stems from lithos (rock) and opsis (similar to). Other common names for these fat plants include: living stones, flowering stones, and (affectionately) butts. In Namibia, the locals refer to them as “cattle hooves” or “sheep hooves” due to their hoof-like appearance. Lithops hail from southern Africa. They are found in very arid regions, some of which receive less than 4 inches of rain a year! This is the driving factor in why they look so strange – water conservation. While all succulents are adapted to conserve water, none do it so well as the Lithops. They rarely drink at all, and when they do, it isn’t very much. In fact, some wild Lithops never see rain. They survive by drawing moisture from mist or fog a few times a year. The Lithops’ unusual shape is for more than just water conservation, however! In the wild, they grow level with the surface of the ground, mixed in amongst the rock and sand. It’s very difficult even for experienced horticulturalists to find wild Lithops, so you can imagine that grazing animals have an even rougher time of it. Even more fascinating is the way they get sunlight. It probably occurred to you that, being underground and all, only the very top of the plant gets any sun. Well, those flat-tops are comprised of cells that act as windows, allowing the light to penetrate deep into the plant where it can reach more chlorophyll. This ingenious adaptation lets them live underground, safe from predators and from the sun. The structure of the plant is fascinating, too. Lithops don’t have a true stem. They usually have two leaves which taper down in a conical fashion directly to a tap root. The roots are large compared to the plant, up to 6 inches, so a deep pot is necessary. An older specimen of some species will have more than one pair of leaves connected to the same root, and they grow in a crowded cluster. You might be interested to know, there are tales of people using these plants for water in emergencies. It certainly fits with the stereotype of eating cacti when lost in the desert! Whether or not that is true, it is a fact that Lithops are non-toxic to people and animals. Look here for some cacti and succulents that are definitely edible. Like most succulents, Lithops are from arid regions. Because of that, they require fast draining soil. Sublime Succulents has written all about succulent soil. But these guys in particular usually require even more specific soil type. You see, they’re basically rocks. Rocks that grow a little bit. Rocks like to be around other rocks. That’s why we recommend you plant your Lithops in a growing medium with very little organic matter. One half succulent soil mixed with one half perlite is acceptable, but the less soil you have the better. The optimal growing medium for Lithops is one heavy with perlite, coarse sand, gravel, pumice, and/or lava rocks. Approximately 1/5 of the medium should be organic matter (soil) and the rest should be mineral. In fact, Lithops do very well in a soil-less medium. They don’t really need dirt, as it turns out. When you purchase new Lithops or find another reason to repot them, you should try to do it during a growing season (spring or autumn). The best time to replant succulents is right before you water them. Watering helps promote new root growth, and helps to stabilize succulents in a new pot. However, if you need to replant Lithops at a time when you shouldn’t be watering (summer or winter), just don’t water it. This is the most important part of Lithops care – and the one that most people get wrong. By the time succulent enthusiasts acquire their first split rocks, they’ve probably been growing for a while. They know all about basic succulent care and have propagated many a fat plant. But Lithops don’t follow those same rules. They have a very distinct seasonal cycle that determines watering schedules. Summer: Do NOT water! They are dormant during the summer, and any watering could kill them. They expect this season to be bone-dry with no humdity or rain. Watering will cause them to become mushy and rot. Make an exception only if they become very wrinkled – then you can water a very small amount of water and they will plump up again within a week. Autumn: In the early autumn, Lithops resume growth. The first sign is often a bud that forces its way out from between the leaves. This shoot becomes a flower, and you can often see the beginnings of new leaves around this time. Jump-start the growing process by giving it a full watering at the beginning of this season, entirely drenching the plant. Continue watering as necessary. Remember to never water a succulent if the soil is still damp from the last time. Winter: Do NOT water! During this season, the new pair of leaves are drawing water from the old ones. They will appear to shrivel over time, and the new pair will steadily grow. If you water, the old leaves will try to drink it, which ultimately confuses the plant’s growth and will cause both sets of leaves to die. 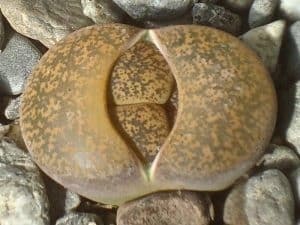 Just leave your Lithops entirely untouched during this season. Additionally, make sure they are not exposed to temperatures below 55°F. They are made of mostly water, and don’t do well in cold temperatures. Spring: Once the old leaves have shriveled up into paper-like husks, you may finally remove them and resume watering. Water lightly to encourage the new bud to begin growth, then gradually increase it to full waterings as necessary. If you follow these guidelines on watering, your Lithops should live a full life (40-50 years). Be aware that for some Lithops, watering may only be necessary 3 or 4 times a year. For others, you can water them every couple of weeks during their growing seasons (spring and autumn). 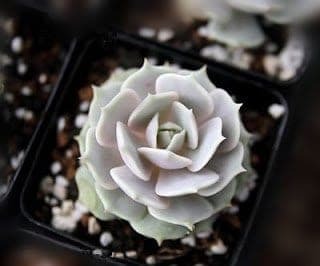 When it is time to water, water them like any other succulent – pour water near the base of the plant until the soil is drenched and water begins to drain out of the bottom. If in doubt, don’t water until you see visible wrinkling on the leaves. You will still have plenty of time to rectify any thirst problems before permanent damage comes to your plant. If possible, water in the morning. This allows the water to evaporate during the day, and less harmful moisture is retained in the roots. supplement their light. 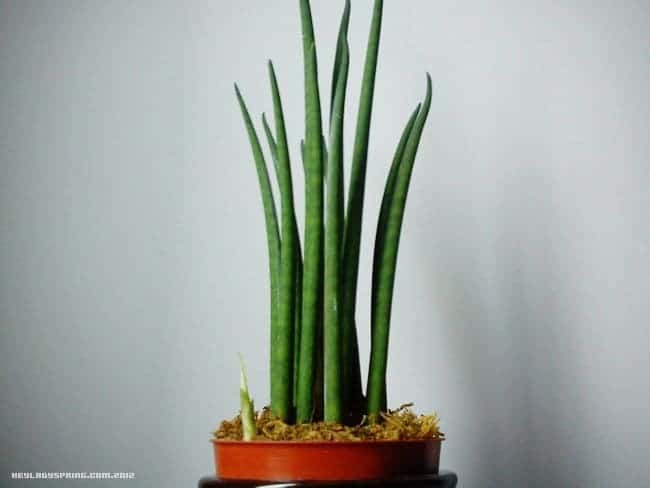 If your plant begins to grow elongated, or leaning to one side, it is suffering from etiolation. While not inherently harmful, it is not especially aesthetic. If you’re just bringing home a new pal from the store, be cautious about introducing it to bright light too quickly. Sun burn is a very real issue for succulents. Either use a shade cloth initially, or put them in an area with less direct sun. You’ll want to work them up to about 5 hours a day of direct light, and the remainder of the day in indirect light. Proper lighting is important in maintaining the vibrant coloring of succulents. As you well know, lots of succulents can be propagated via leaf. Unfortunately, Lithops only have two and they need them both! Some species will grow more than one head, and the pairs of leaves will bunch up around a shared root system. 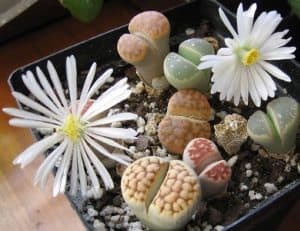 This often takes many years to develop, but if you find yourself in possession of such a Lithops, you can separate the roots and split up the buds to have more plants. 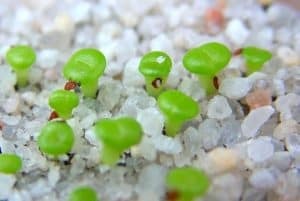 The most common way of rearing new Lithops is via seed. You can order mature plants online, but if you want a lot of them and don’t mind waiting, you should buy some seeds and get sowin’. Growing Lithops through seed is similar to most other succulents. 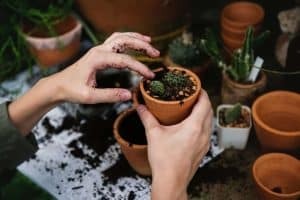 Here’s an article about how to grow cacti and succulents from seeds. In fact, if you have a few Lithops, you can get your own seeds! Their flowers look just like daisies, and range from white to yellow to orange. During autumn, when the flowers open up, cross-pollinate them. They don’t self-fertilize, but you can use a Q-Tip or a paintbrush (or a plant pollinator) to transfer pollen from one flower to another. When the flowers die they leave behind pods that open up when doused in water. You can open them manually, of course, and collect the seeds. Lithops rarely, if ever, require fertilizer. However, if you are in a soil-less medium, you should consider a very small, diluted amount of fertilizer yearly. If your Lithops failed to flower the last year it might be because it’s too young. They generally begin flowering after about 3 years. Add a small amount of fertilizer in the spring to encourage flowering. Plant your Lithops about half an inch above the soil surface, rather than level with it. Then, fill the rest of the pot with colorful stones of various shapes and sizes. 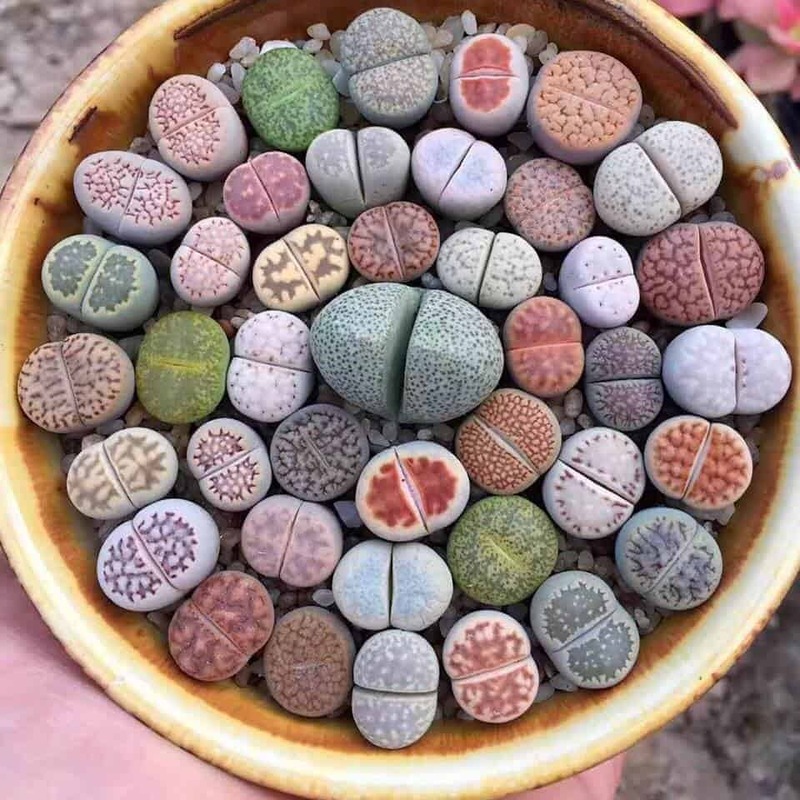 This creates an aesthetic that is unique to Lithops. It mimics closely their natural habitat while emphasizing that natural camouflage that makes them so popular. While there is a defined seasonal cycle for these plants, individuals may be at different places due to their history. 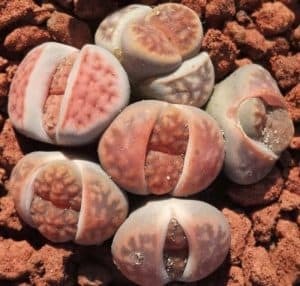 If you get multiple Lithops from different sources, be careful treating them all the same until you are certain their cycles are synced (or close to it). Watch each plant closely to make sure your care is not harming it. After a couple seasons, they should all be on the same page! Due to drastically different watering needs, Lithops do not pair well with other plants. They should always be planted alone or with others of their kind. Thanks for the info; I didn’t know way mine died, I know now to much water! I hope I can find some more and try again. You’re definitely not the first. Everyone does that the first time! Hi Patrick, do you know the name of the species in the centre of the pot in the photo? I have just bought two ‘Lithops sp.’ and they look much like that one, except with some extra leaf pairs on top! Your guide here will come in very helpful, but I was hoping to find out a bit more about the particular species I have. Thanks for sharing your knowledge with this guide. If we’re talking about the same photo (the one at the top), the middle plant is actually NOT a lithops. It’s a close relative called a Split Rock (whoever names these isn’t super imaginative). I believe the one in the picture is a Pleiospilos nelii. Hope that helps! Many thanks Patrick, that would explain why I couldn’t ID it. I can now find out how to look after it properly. A nice plant, if not what I thought I was buying! Does your watering advice apply to lithops here in Hawaii where the weather is pretty much the same all year (temp 70s to 80s F)? Also does it apply to lithops which are too young to flower, say those under 3 years old? In a place with that’s warm year-round, the Lithops are going to mostly act like it’s spring/summer forever. Their regular growth cycle will be a little different. Instead of following the seasonal guide above, look for cues from their growth. Is it very wrinkly or about to flower? Give it a drink. If it’s splitting – don’t water. In a humid place like Hawaii you have to be very careful to let it dry out. You’ll probably only need to water it once every month or two. Just monitor it carefully. Good luck! Hey Patrick, I recently bought a new lithops. I live in Southern Ontario, Canada. My house is dry all year-round and my plant gets around 9 to 11 hours of indirect or direct sunlight depending on the weather. My plant is in a 2.5 inch pot, and the plant itself is 1 inch long. It is in 100% gravel. I often struggle when it comes to watering. Knowing all this information, could you give me a recommendation for the time in between each time I water, and approximately how much I give it? Thanks! Whew, that’s a tough one. For any succulent, and Lithops are no exception, you should always thoroughly soak the soil (or gravel in this case) all the way through. Pour until water comes out of the bottom. Since you plant is new, it’s likely acclimating to the new space. Don’t water it at all. Follow the instructions in the above article for the seasonal watering guide (it’s winter in Canada, so don’t water). Only make an exception if it begins to shrivel up significantly (then maybe do a little water instead of a full soak). As with any new plant – monitor it carefully. Don’t be surprised if this one doesn’t make it. Most people have to try Lithops a few times to get the hang of it. Good luck! The article was great and was not bored reading it. I’m quite interested in growing Lithops and I’m just a beginner with plants. Lithops are a pretty difficult plant since they’re touchy about water. Tropical climates, then, are not ideal. The humidity and frequent rains will keep the soil damp, which is a death sentence for Lithops. Try keeping them indoors instead! Hi Patrick 🙂 Amazing article. I have a few questions I was hoping you could help me with. I keep on reading lots about the growth cycle but am still confused about what’s happening with my plants. I recently purchased my first ones from a private collectioner/grower and they seem to be in different cycles because of their age and species difference (acuampiae, l. albinica and fulviceps). They were sent to me via post, soil-less of course. 1) until mid-late March don’t give them ANY water whatsoever. 2) give them a bit of water to get them going if you repotted them – REGARDLESS of the cycle they’re in. I have no idea what to do. I’m in northern hemisphere, 8a zone. Spring is coming, temps are about 40-66F. Water or not water in a week, and how much? Also, most of them are mid-split, but their leaves are nowhere near dry to start watering. Does this mean that I can gradually start misting them mid-late March until I get to a few good soaks in May-June? Or am I not allowed to even mist until their leaves are paper-thin crust? Also, after their Summer dormancy, everyone says to give them a good soak in Autumn to start their growth cycle. Considering they were dormant, does this mean gradually start watering or does the very first Autumn watering have to be a good drench? Also, do I wait for it to start flowering and then water, or do it beforehand? I think that sometimes people get too caught up in dates and seasons, but in reality, plants don’t operate on a calendar. That’s especially true if they are growing indoors – the effects of dormancy are mitigated or even nullified entirely. So take all that seasonal info with a grain of salt. Although normally watering after a repot is a good idea, I’d hold off with Lithops. Lack of roots isn’t really a big deal for succulents anyway. They’ll get around to it. If they are mid split, it’s probably a bad time to water them. I would err on the side of caution and not do it at all. These days, I’m in the no-mist camp. I think you should really just soak them or not water at all. That applies to the Autumn watering too. I think the flowers-timing should be based on the appearance – is it very wrinkly? Then go for it. You know how it goes with these guys; any extra water could kill them. It’s a lot easier to fix (and diagnose) dehydration than to fix overwatering. Yeah, the amount of water is unimportant – it only matters how long the soil stays wet. For a gift I received Lithop seeds, for germination can I use aquarium gravel on top? What a thoughtful gift, I’m jealous! You can use aquarium gravel if you want, although the seeds are so small they usually do better on something that has fine particles so they don’t get lost down in the cracks. I’d recommend a gravelly sand mix (so maybe just add sand to your aquarium gravel). Also, be sure to put the seeds on top! No need to bury them.